We all know you should never judge a book by its cover, but your buyers will. Brochures are often the first glimpse prospective buyers have of your properties. Professional, well-designed property brochures speak volumes about your estate agency and can make all the difference between a successful viewing and a forgettable property. Quick and easy brochure templates. Our estate agent brochure template creates consistency across all of your marketing materials, even across multiple branches. There are many great templates to choose from, which you can customise to perfectly represent your brand identity. If you’re thinking about revamping your branding you’re in luck! Our in-house designers help estate agents to re-imagine their corporate identity with great-looking logos, artwork and fonts. We’ve got plenty of examples of brochure branding – why not take a look? Build your brochures, your way. Once you're happy with your corporate identity, your redesign can be easily applied to your property brochure design. When your template is ready, there's no need to start from scratch. Simply fill your template with property information already on your system to produce a sleek, inviting estate agency brochure design that makes house-hunters look twice. Each template is highly customisable, giving you the freedom to select font sizes and styles, photograph positioning and other design features. Choose double sided printing, pick your template, decide on your perfect brochure size and pull everything together seamlessly. The key to an eye-catching brochure is in the photos and unlike our competitors we don’t shrink these down. Your properties are shown in their full glory with clear, high quality images. How you use your completed property brochure design is entirely up to you. Our templates are all suitable for printing in the office with a laser printer, or you could have high quality copies printed and posted to you thanks to our partners at Ravensworth. You can send the brochure as a PDF to the vendor or landlord for their approval, or even upload it onto your website. This is a great way to show off luxury properties that deserve a quality listing. We provide full, flexible training with every AgentPro software purchase, so you and your team can get up to speed in no time. And should you ever require any assistance our UK support team are ready and waiting. 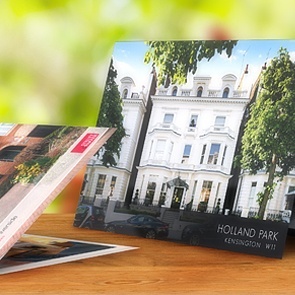 Ready to start producing sophisticated property brochures in just a few seconds? Get in touch today on 08456 444 446 or arrange a free demo now.